Women journalists Rojda Oğuz and Beritan Canözar were released from prisons in Van and Diyarbakır provinces on Monday and Tuesday to be tried without arrest. Both journalists work for the all-women news agency JİNHA and have been pending trial under arrest. Meanwhile, freelance journalist Tuğba Tekerek was briefly detained in Diyarbakır today for taking a picture in the courthouse as she and other journalists were there to support Canözer. While it is forbidden by law to take pictures inside a courtroom during the trial, the rest of the courthouses are not limited; making Tekerek’s brief detainment totally arbitrary. Meanwhile, Turkey’s Foreign Ministry sent a diplomatic note to embassies as to ambassadors monitoring the case hearing of journalists Can Dündar and Erdem Gül after president Recep Tayyip Erdoğan’s furious stance in the weend.. However, the US and UK stood behind the diplomats by stating attending a then-public trial as observants is within diplomatic procedure. The Foreign Ministry of Italy also stated that their ambassador’s presence there was within the limits of the Vienna Convention. Confusing freedom of expression with “terrorism” as usual, Turkey also goes after academics as it does with journalists. Unlike the president’s expected reaction to the academics who signed a statement for an end to the bloodshed in eastern Turkey by stating they will “pay the price,”Prime Minister Ahmet Davutoğlu commented on the issue and said at least the arrested three should not be tried while kept in prison. However, as the weekly Nokta pointed it out, prominent pro-government dailies Sabah, Star, Akşam, Yeni Şafak and Yeni Akit did not feature this comment in their related news stories. The fuel smuggling indictment against suspects including businesspeople Aydın Doğan and his daughter Hanzade Doğan Boyner is accepted by the 1st Istanbul Court of Serious Crimes, according to reports. CPJ has reported the existence of the indictment last week and Doğan Holding has released a statement on March 17 regarding the accusations against them. Another statement arguing the accusations’ validity was released yesterday after the court accepted the indictment. Meanwhile, it was announced yesterday that radikal.com.tr, the last stand of the liberal left daily Radikal of the Doğan Media Group after it was stopped being printed, will be shut down by the end of the month. Pro -government daily Akşam claimed a Turkish prosecutor is about to go after businesspeople and media owners Aydın Doğan and, his daughter, Hanzade Doğan Boyner with accusations of running a fuel smuggling organization in a story published at the top story of their yesterday’s front page. Though the existence of such an investigation is not official yet, it caused a drop in the shares of the Doğan Holding shares according to Reuters. Doğan Media Group used to be the biggest media owner in the country before they let go some of their media organs to government-friendly businesspeople. Aydın Doğan have a rocky relationship with the ALP government and President Recep Tayyip Erdoğan throughout the years which can be remembered with the landmarks such as the massive tax fine against the group in 2009, cutting the ribbon together to open the Doğan-Trump partnership Trump Towers in Istanbul in 2012 and the accusations exchanged over a real estate permit issue in İstanbul last year. Turkey government recently made moves against pro-Hizmet Koza İpek Holding and Feza Journalism company through trustees attended by courts and they either shut down the featured media organs or turned them into government propaganda tools which leads to rumors enough to cause worry about whether if Doğan is next or not. Dicle News Agency (DİHA) reported on March 17 that their internet address was blocked from access in Turkey for the 33rd time and news website Demokrat Haber tweeted today that the had the same experience for a second time. DİHA’s original internet address diclehaber.com was blocked by Turkey’s telecommunications regulator, the TİB, on July 24, 2015 according to local reports. Demokrat Haber’s original address was blocked to access on January 28, 2016 alongside news websites sendika,org and Yüksekova Haber which were being blocked for the tenth and second times; local reports say. Blocking access to internet addresses and social media by TİB through selective court orders have been a constant problem for Turkey. Many Turkey citizens use Virtual Private Networks (VPN) or similar measures to mask their actual location to bypass the internet censorship in Turkey. Der Spiegel reported also on March 17 that their Turkey correspondent Hasnain Kazim’s working permit was not extended and he had to be called back. Kazim had previous troubles in Turkey regarding his reporting; particularly interviewing a relatives of dead miners after a mine disaster and putting their angry statement at the president on a headline, which has led to his leaving of the country temporarily due to death threats. On March 16, President Recep Tayyip Erdoğan said the columnists who want his resignation are allies of terrorists in a speech he gave today; clearly stating there won’t be any recent end to crackdown on the Turkey press. The president spoke at a meeting with muhtars in Ankara which was broadcasted live as all speeches of Erdoğan and was reported by nearly all the media organs in Turkey including the independent news website t24 and pro-government daily Yeni Şafak. Two days ago, Erdoğan has said he saw no difference between “a terrorist holding a gun or a bomb and those who use their position and pen to serve the aims” of terrorists after the latest suicide bombing attack in Ankara and argued the definition of the term “terrorist” should be widened; BBC has reported. Turkey has been combating the PKK since the early eighties. The decades long struggle has caused many violations of press freedom and news blackouts which only intensified in recent months since the failure of a peace process in 2015 led to urban warfare at several hot spots in Turkey. A “terrorism propaganda” investigation is started against the pro-Kurdish daily Özgür Gündem on March 14 and all the “yellow press cards” of the journalists at the daily got cancelled on March 15. The terrorism propaganda is based on the daily’s headline after the latest suicide bomb attack in Ankara on Sunday. According to Özgür Gündem, Ankara Chief Prosecutor’s Office believed the headline “Footsteps of the Newroz (traditional spring festival)” was about the bombing. Özgür Gündem journalists also received SMS from the state on March 15; stating that their yellow press cards are cancelled. The press cards in Turkey are granted by a bureau of the Prime Ministry according to the criteria decided by the state. Moreover, pro-CHP daily Cumhuriyet, published a column with the byline Cumhuriyet and voiced worries about alleged plans to take over their newspaper. the daily reminded the pro-AKP columnist Ersoy Dede has stated Cumhuriyet will be next after Zaman and they reminded the slander campaign after the Ankara blast. Pro government accounts on twitter and some pro-government news ites and newspapers have claimed the suicde bomber was a Cumhuriyet reporter and the car used in the attack was hidden at Cumhuriyet car park. Cumhuriyet has announced that they never had a reporter with that name and they do not have a car park in Ankara. Barış İnce, editor for the leftist daily Birgün, received a 21 months long prison sentence from an Istanbul court March 8 for insulting President Recep Tayyip Erdoğan and appealed the verdict. The journalist will not be put under arrest unless the high court approves the verdict. On October 20, 2014, İnce was on trial as the responsible editor for Birgün, with charges of “defamation” and “violation of secrecy” regarding his newspaper’s coverage of corruption allegations against then-Prime Minister Erdoğan and his son Bilal. He has presented a written defense which featured an acrostic; the first letters of the each paragraph read “Tayyip the thief” (Hırsız Tayyip) from top to bottom. İnce has personally stated the existence of the acrostic. The defense text was also the headline story of the next day’s Birgün with the acrostic included. This turned into an investigation for insulting the president which led to İnce standing in front of another court on June 2, 2015 with that charge. The 2nd Istanbul Criminal Court for General Jurisdiction sentenced the journalist to 21 months in prison on March 8 and did not delay the sentence. İnce’s legal defense appealed to the verdict at the Supreme Court of Appeals which will answer on a yet undetermined date. Turkey’s critical daily Zaman got immediately transferred into a propaganda piece for the government following the takeover by a court assigning trustees with the accusation of “terrorist propaganda.” Similar to what happened at the Koza İpek Holding takeover late last year, reports show that the police entered the Zaman building by force, pushed journalists around and the process continued with key journalists being fired and the Zaman‘s Internet archives are feared to be erased. As of Monday afternoon Turkey time, the website of Zaman was currently inaccessible with an under construction note on display. Zaman‘s Chief Editor Abdülhamit Bilici and Today’s Zaman‘s former Chief Editor Bülent Keneş were the first to be fired by the new management according to reports. Zaman’s sister publication, English language daily Today’s Zaman‘s website seemed operational at the same hours but Sevgi Akarçeşme, chief editor of the daily, said that as far as she knows the archives of the newspapers are not erased but the trustees have unplugged the servers so no new content may be entered. Today’s Zaman has a weekend edition that stays at the newsstands for Saturday and Sunday both. Both dailies’ teams have sent the Friday editions early before the trustees arrived with the police. Saturday edition of the Zaman was perceived as a government propaganda organ as many independent observers foreign and domestic. As for Today’s Zaman, Akarçeşme said the trustees censored all the columnists to be featured on the Monday edition so her team removed their names from the newspaper; refusing to work with censorship. She said two more stories were removed from the daily later on Sunday evening before the newspaper went to print. The court order assigned the trustees to the Feza Journalism Group which houses Zaman, Today’s Zaman and Cihan News Agency. Zaman was one of the top selling dailies of the country and Today’s Zaman was one of the two existing English language dailies critical of the Justice and Development Party (AKP) government. Cihan News Agency is the only other news agency in the country big enough to cover the election results live other than state controlled Anatolia Agency. 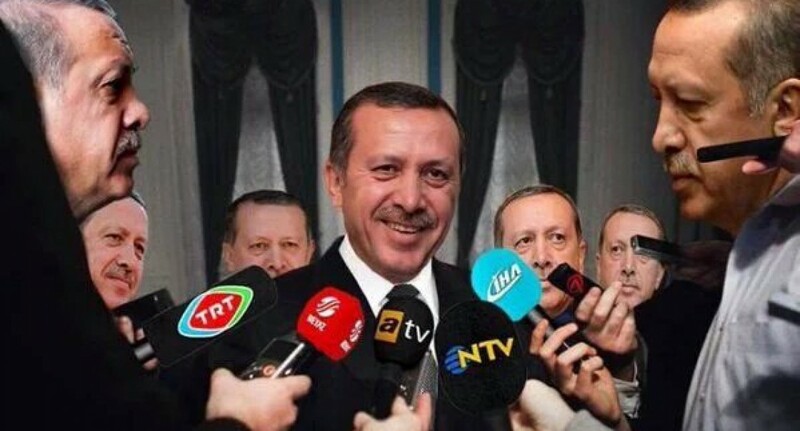 Erdoğan regime pillaged another media group with the same method of “trustees” practiced against Koza İpek. Zaman and Today’s Zaman are in the hands of AKP people.